Noteworthy presence since 1977 in the industry has helped us gain reputation as a formidable manufacturer, exporter and supplier of Industrial Fasteners, Nuts & Bolts. Our Brass Fasteners are in accordance with international standards of quality and are designed using high quality brass. Our extensive variety of includes Brass Hex Bolts, Hex Nuts, Brass Square Nuts, Bimetal Washer, Brass Round Head Bolts and Brass Screws. 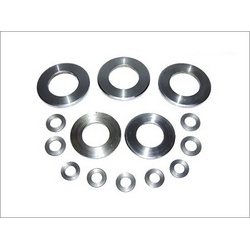 Additionally, we are also engaged in offering quality range of Brass Dome Nuts, Brass Anchor Bolts, Brass Wing Nut - Light & Heavy and Press Parts. These products are immensely popular for high tensile strength, dimensional accuracy and availability in various shapes & sizes. We have advanced facilities and modern machinery that help us design flawless products, which meet the needs of the clients precisely. Various welding, molding, cutting & special purpose machines are used by our team to ensure optimality of our operations and manufacture bulk consignments on time. Our team makes sure that our range conforms to highest quality benchmarks and is available in customized specifications. Superior quality of our range has helped us to reach out to the clients based across India. Further, our range is in great demand in mechanical, automobile, electrical, construction, engineering & aeronautics industry among others.